Halifax, NS – 17 October 2018 – DHX Brands, the dedicated brand management and consumer products arm of DHX Media, is teaming up with Fierylight, IMG and Zippos Circus to spread holiday cheer with the first-ever live Teletubbies Christmas Show, taking place at Hyde Park Winter Wonderland. Bringing Teletubbyland to life off-screen, the special holiday production runs daily at 11a.m. in the MegaDome beginning on 23 November, 2018, until 6 January 2019. IMG’s annual Hyde Park Winter Wonderland is the UK’s biggest Christmas destination and transforms London’s Hyde Park into a world of sparkling magic. 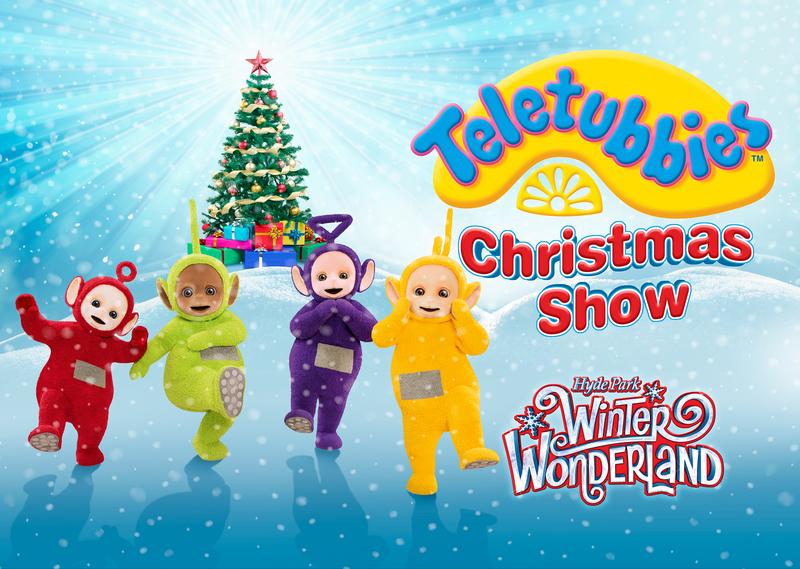 Created especially for children, the popular Teletubbies live show comes to Hyde Park Winter Wonderland for its inaugural Christmas special starring Tinky Winky, Dipsy, Laa-Laa and Po. At 45-minutes long, the interactive Teletubbies Christmas Show brings a magical world of love, laughter and seasonal fun to young visitors and their families in the iconic Zippos Circus MegaDome, with its family-friendly Big Top atmosphere and seating. Now in its 12th year, Hyde Park Winter Wonderland has become a landmark event for Londoners and tourists alike, attracting more than three million visitors each year. Open from 10a.m. to 10p.m. daily, it offers a one-stop shop for festive celebration. Winter Wonderland is free to enter, with a choice of ticketed attractions, thrilling rides, Santa Land, Christmas Markets and a variety of food and drink offerings. DHX Brands is the dedicated brand management and consumer products arm of DHX Media Ltd. (TSX: DHX, NASDAQ: DHXM), one of the world’s leading children’s content and brands companies. DHX Brands specializes in creating, building and maintaining high-profile global entertainment brands within the children’s and young adult markets. With expertise in brand development, licensing, marketing and creative, we build and manage brands that captivate and inspire through engaging content, first-class distribution, quality consumer products, immersive live experiences and digital media. DHX Brands’ world-class portfolio includes Teletubbies, Strawberry Shortcake, Twirlywoos, Massive Monster Mayhem, In the Night Garden and Mega Man. DHX Brands has operations in London, Toronto, Los Angeles and Hong Kong. IMG is a global leader in sports, fashion, events and media, operating in more than 30 countries. The company manages some of the world’s greatest sports figures and fashion icons; stages hundreds of live events and branded entertainment experiences annually; and is a leading independent producer and distributor of sports and entertainment media. IMG also specializes in sports training and league development, as well as marketing, media and licensing for brands, sports organizations and collegiate institutions. IMG is part of the Endeavor (formerly WME | IMG) network. Zippos Circus is best known as Britain’s favourite touring circus. The organisation also produces Cirque Berserk – a unique circus created especially for theatres, and has produced a number of shows for Hyde Park Winter Wonderland over the last 10 years, including, this year, Teletubbies Christmas show and Winter Wonderland Comedy Club. Fierylight is a Fiery Angel and Limelight partnership producing quality commercial work for young audiences since 1996. This creative partnership is headed by Richard Lewis for Limelight and Edward Snape for Fiery Angel. Producing in the UK, both in the West End and touring regionally, as well as the USA and Australia. Fierylight primarily adapts branded children’s TV programmes for the stage, most recently Peppa Pig, Lazy Town Live, SpongeBob SquarePants, The BFG, Ben & Holly’s Little Kingdom, Octonauts, and Teletubbies.